Boat Lifts Fairhope | Marine Construction | Team Simco Lister Inc.
We Build, Install, and Repair! Keep your personal watercrafts high, dry, and away from damage and get high-quality boat lifts here at Team Simco Lifter Inc. in Fairhope, AL. We offer more than 20 years of experience in the marine construction industry to provide you with ingenious watercraft storage solutions tailored to your specific needs. Our team is equipped with extensive knowledge, skills, and tools to build you the perfect boat lifts, boathouses, cargo lifts, seawalls, and piers. Partner with us today! Why Choose Team Simco Lifter Inc.? Through the leadership of President Wendell Simmons and Vice President Andy Simmons, our team continues to offer first-rate watercraft products and services to our clients. We bring to the table our blend of expertise, professionalism, and efficiency to create amazing results that you are sure to love. Rely on us to provide you with boat lifts and other storage equipment to help keep your watercrafts safe and clean. 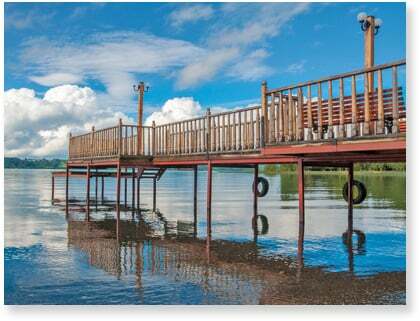 If you are looking to have a Jet Ski lift, boatlift, or dock constructed on your property, you have come to the right place. Having handled numerous projects in the past, we are confident in bringing to life your ideas. Get in touch with us today and discuss your plans with us. We look forward to hearing from you!